Many customers have been hesitant to take advantage of the very strong market of used pianos because they do not have the knowledge required to make the right choice. If you are a prospective buyer, and would like assistance in finding a piano for your needs, please call us at 847-256-5225. Whether it be privately or from another respected dealer, we can locate and insure a quality piano. Additionally, we can provide you with movers, tuners, and perhaps a teacher! In short, we take the worry out of buying a used piano. We will be regularly updating our list of curated and approved pianos below. Check back regularly before yours is purchased. If you prefer, fill out the form to the right and will search for you. 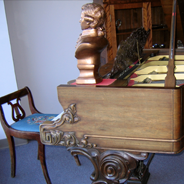 Many of our pianos do not even make it on to our website before they are sold. Again, feel free to call us at 847.256.5225.